1. The ambulance wagons were not allowed to go nearer the action than ROUGE CROIX. 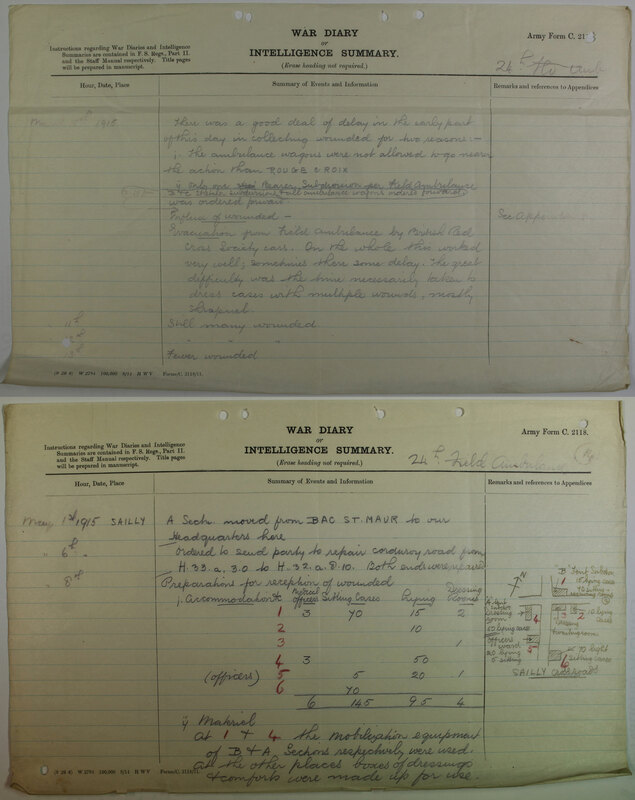 3.15 pm B & C stretcher subdivisions & all ambulance wagons ordered forward. Evacuation from field ambulance by British Red Cross Society cars. On the whole this worked very well; sometimes there [was] some delay. The great difficulty was the time necessarily taken to dress cases with multiple wounds, mostly shrapnel. A Section moved from BAC ST MAUR to our Headquarters here. Ordered to send party to repair Corduroy road from H.33a 3.0 to H.32.a.8.10 [map references]. Both ends were repaired. At 1 & 4 the mobilization equipment of A & B Sections respectively were used at the other places boxes of dressings and comforts were made up for use.